All season, Jefferson and Grant have been 1-2 in the Oregon School Activities Association boys basketball rankings. If this week's Class 6A tournament at Chiles Center goes to form, the Democrats and Generals will meet at 8:30 p.m. Saturday with a championship on the line. Among the six teams hoping to write a different script is Lincoln, which has reached the quarterfinals for the first time since 2012, giving the Portland Interscholastic League three of the quarterfinalists. Jefferson, the PIL champion and defending state champ, will be shorthanded, however, according to coach Pat Strickland. Junior guard Marcus Tsohonis broke a middle finger in Saturday's 77-52 win over Grants Pass. So the Demos (24-3 and unbeaten against Oregon schools) are preparing to be without one of the state's top players. The 6-5 Tsohonis, the PIL player of the year and all-tournament in 2017, was hurt when he fell to the floor after being fouled on a dunk. "We're still excited about the opportunity we have," Strickland says. "We're going to do anything necessary to keep this trophy on North Kirby Avenue." The first challenge comes at 1:30 p.m. Thursday against Jesuit (21-5). The Crusaders were ranked eighth by the OSAA going into the playoffs, but Strickland says Jesuit is one of the five best teams in Oregon. Strickland can turn to defensive-minded players or to shooters to fill Tsohonis' starting spot, or perhaps move 6-10 Kamaka Hepa to a wing and insert one of his other post players. Strickland says it's about responding to adversity, a subject he has been harping on all season. "All year we've said we have such a deep team, such a talented team, that we can possibly miss one or two guys and still get the job done," he says. "It will make us have to work harder and tweak things a little. You've got to compete." For Grant, this week is at least partly about redemption. Jefferson won three close games between the rivals this season after beating the Generals four times a season ago — including in the quarterfinals. After his team beat McMinnville on Saturday to secure a return trip to state, Grant coach Robert Key said his players naturally think about getting one more shot at Jeff. But he says that won't distract them from the task -- which starts with Thursday's 8:15 p.m. game against 10th-ranked West Salem (19-7). Grant's 6-9 Kelton Samore, second-team all-tournament last season, agrees. "Hopefully we have another shot at them (the Demos). But we try to keep a short memory and take it game by game," the senior says. Remembering the Chiles Center — two disappointing losses and one win a year ago — might help the Generals. The 6-10 Samore, senior Damon Hickok and juniors Aaron Deloney and Ty Rankin played significant minutes in the 2017 tournament. Deloney says the Generals have a better mentality and communicate better with one another than they did as newbies to Chiles last March. He says they are ready for whatever opponents throw at them. "We see a different 'D' every night," Deloney says. "We've just got to play no matter what the defense is. We don't change our game; we play the same every day." 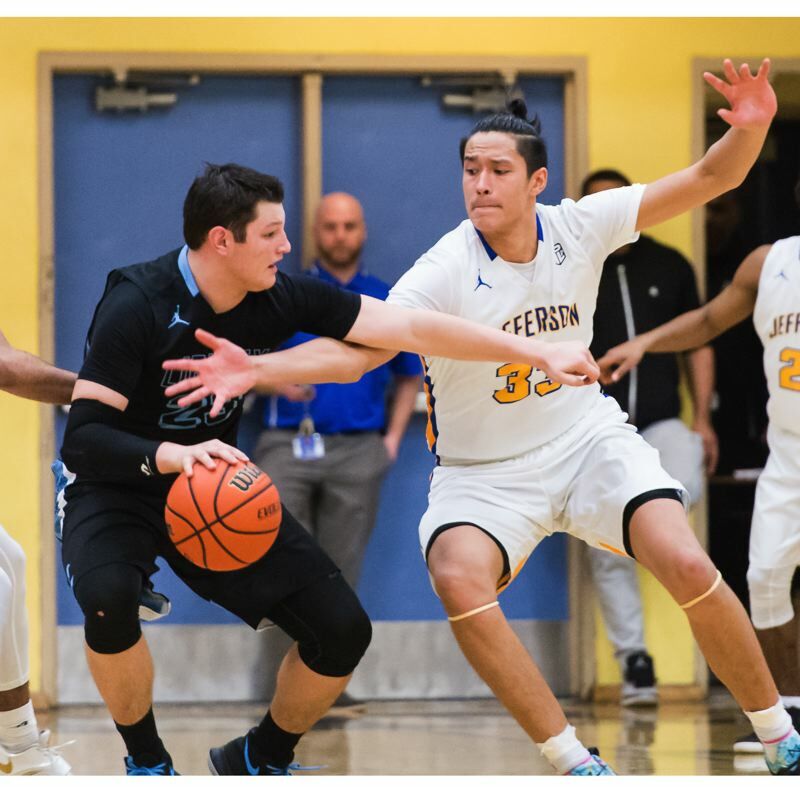 That means turning defense into offense, as Grant did directly for 13 of its points in Saturday's 85-66 win over McMinnville, a game in which four consecutive takeaways to start the fourth quarter ensured there would be no Grizzlies rally. "Coming into the season, I said our offense will be predicated on our defense," Key says. "And their basketball mind-set is they play for each other, they feed off each other. You can see how they share the ball, and share it with a smile." If Samore has his way, the smiles will wait for postgame. "We want to come out strong at the beginning of every game, especially at the Chiles Center," Samore says. "We're not playing around anymore. We're coming for teams." Samore got after it against McMinnville, scoring 25 points, blocking six shots and grabbing nine rebounds as Grant (22-4) secured its quarterfinal spot. After a dramatic 82-81 double overtime win at Lake Oswego on Saturday, Lincoln coach Pat Adelman was thrilled that his eight seniors will experience a state tournament. Adelman cherishes his experience playing in the then-4A tourney in 2007 as part of a Lake Oswego team that lost to South Medford in the title match. Adelman says the bonds of this Lincoln team remind him of those Lakers. The core of the Lincoln senior class has played together since middle school, and Adelman is convinced they will be ready to make the most of this week. The caliber of PIL basketball is one reason for such confidence. Grant lost only to Jeff and Oak Hill Academy of Virginia, and Lincoln was one of six teams that battled for third place in the PIL. "You take some lumps, you've just got to learn from them," Adelman says of PIL play, which he compares to Southeastern Conference football. "Our guys keep getting better." The Cardinals (17-9) are led by 6-4 senior point guard Bryce Sloan, an all-PIL selection who contributed 43 points, 20 assists and 11 rebounds combined in playoff wins over Oregon City and Lake Oswego. With four senior leaders and proven depth — 10 Cardinals played on Saturday and multiple players made big shots — Lincoln could have staying power at Chiles Center. "We've got too much talent to not use everybody," Adelman says. Ranked 11th, and one of four teams outside the top eight to reach the quarterfinals, Lincoln faces third-ranked Southridge (23-3) in Thursday's 6:30 p.m. quarterfinal. The Skyhawks beat Roosevelt, which shared third in the PIL with Lincoln, by eight points in Saturday's second round. Jefferson's Strickland says the PIL was the toughest league in the state this season, noting that even in double-digit wins his team didn't pull away until late in games. Strickland says he thought the league might get four of the final eight, so he is not surprised Lincoln made it. Both of the Democrats' wins against the Cardinals were by seven points. "They just play together," Strickland said of the Cards. "They played defense. They were't scared of us, and they made us work for everything."